Tia Booth is putting speculation to rest by sharing her side of the story on her past relationship with Colton Underwood, who is now a bachelor on Becca Kufrin's The Bachelorette season. As Colton disclosed in The Bachelorette's latest episode, the 26-year-old former pro football player from Denver, CO, briefly dated Tia, a physical therapist from Arkansas, before he began competing for Becca's heart. The dating revelation made Becca feel sick to her stomach, as she was genuinely attracted and drawn to Colton from Day 1 -- but Tia is her close and loyal friend from Arie Luyendyk Jr.'s season of The Bachelor. "We started talking before my season started airing," Tia explained to People of her romance with Colton that sparked after she taped The Bachelor's 22nd season. "Colton was in the casting process for The Bachelorette, and he followed me on Instagram." Prior to ABC's announcement in March that Becca had been chosen to star on The Bachelorette, Tia was reportedly a frontrunner for the position. "I DM'd him first and within a few days he told me he had applied to be on The Bachelorette," the sassy brunette continued of Colton. "But he hadn't gotten the final call so we thought, 'We get along well, we might as well just keep talking and doing whatever this is.' The whole time I kept thinking, 'What are the odds that he would get on the show?'" Tia told People that she and Colton met up in Los Angeles for a date, but several weeks later, he learned he had been selected by ABC to become a contestant on The Bachelorette. Once Colton discovered the news, "things came to a halt," Tia confessed. "I knew he needed to do what he needed to do." Colton told Becca on The Bachelorette that he had spent a weekend with Tia but the timing just wasn't right for them to get involved. Colton also assured Becca that if his feelings were strong enough for Tia, he never would have appeared on the show. Becca, however, still questioned Colton's honesty, intentions and whether the former athlete -- who also previously dated Olympian Aly Raisman -- might be a player despite his nice-guy reputation having founded a cystic fibrosis charity. As The Bachelorette previews show, Colton also claims to be a virgin. Tia apparently attempted to tell Becca about her relationship with Colton during The Bachelor: After the Final Rose taping in March but did not succeed. "I just wanted to make sure they would give each other a chance," Tia insisted. "I didn't want Becca to see our friendship as the most important thing and not give him that chance." 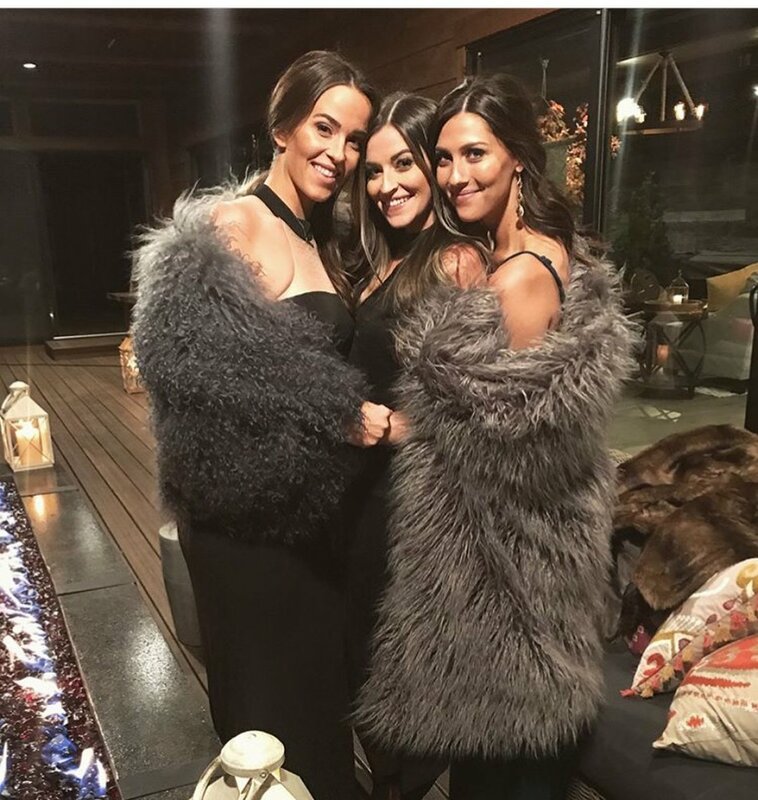 On the next June 11 episode of The Bachelorette, Tia is going to be part of a group date in which a handful of bachelors give Becca's friends manicures and pedicures at the mansion. In an exclusive sneak peek of the broadcast obtained by People, Colton is shown seeing Tia on the date and telling the cameras, "Tia is here. Immediately I was cringing a little bit." "I'm feeling nervous," Colton said. "I really don't think I'm going to be able to relax and enjoy the day. You could tell she was a little shaken and nervous in the beginning, as was I. This is a little bit more than what I expected." When reflecting back on that awkward reunion, Tia owned the fact she experienced some nerves upon seeing Colton in-person again. But Tia clarified to the magazine, "It would have been more complicated if we were an exclusive couple. That was never a thing. We knew logistically it wasn't really going to work." She also apparently views Colton as "such a great guy," although Reality Steve spoiler blogger Steve Carbone previously reported the former pro football player had "ghosted" Tia. "I completely respect him," Tia added of Colton. "If it had been different timing, it could have been something. But everything happens for a reason!"